SHUSHI (Armenian Weekly)— American food icon Anthony Bourdain posted a picture to his social media account on Tuesday night of his cameraman, Jerry Risius, boarding a Russian helicopter, likely to make the journey from Armenia to Artsakh, where he has been featured in pictures across social media. Described by The New Yorker as a “swaggering chef,” Bourdain has built an empire around food, which started with his New York Times best-selling book Kitchen Confidential: Adventures in the Culinary Underbelly (2000). Today, he is well-known as a TV personality, and has starred in shows on Food Network and his Travel Channel show “Anthony Bourdain: No Reservations,” which saw Bourdain travel to unexpected locations, indulging in region’s the local culinary traditions. In “Parts Unknown,” Bourdain travels the world uncovering lesser known places and exploring cultures and cuisine. The show has won five Emmy Awards, as well as a 2013 Peabody Award. Oh my God Anthony Bourdain is shaking in his pants!!!!!!!!!! NOT Give it up nobody cares about your stupid blacklist. The issue of American showman Anthony Bourdain’s visit to Nagorno-Karabakh is under investigation, Azerbaijan’s Foreign Ministry Spokesman Hikmet Hajiyev told APA. He noted that a decision will be made after the investigation. It should be noted that Bourdain has shared a photo on Instagram showing him visiting Armenia and Nagorno-Karabakh. The purpose of the visit is said to be to contribute to the program “Past Unknown". Does this mean Anthony won't be making any show about them, talk about shooting yourself in the foot! Very SMART, well done baboonjan. Very soon the whole world will be on that list. How is that working for your tourist industry, I guess they are too stupid to realize it. And it’s true, Mr. Hajiyev. The attack on Hamparian and the Armenian lobby is a tactical mistake on your part. By doing so, you only build up the ANCA, and your fallacious tweets only become a PR tool for the Armenian lobby. People are not as stupid or ignorant as you may think. It doesn’t really take that much research to see how drastically your government’s record on freedom of _expression_, assembly, and association has continued to deteriorate over the years. From election violations and politically motivated prosecutions to blatant nepotism and notorious press suppression, Azerbaijan is clearly one of the worst violators of human rights in the world. Your ever-expanding “blacklist” and your baseless, unfounded attacks on the ANCA will only hurt your nation—and prove to all what most the world already knows about your country. So, Mr. Hajiyev, if not for the love of truth, then at least for the love of Azerbaijan… just shut up already. Now it's Mexican's turn, LOL! The list bigger the better. The illegal visit of the head of Mexico-Armenia Friendship Group, Blanca Margarita Cuata Dominguez, a member of that group Maria Cristina Teresa Garcia Bravo and another person accompanying them to Azerbaijani lands occupied by Armenia is under investigation, the Azerbaijani Foreign Ministry's spokesman Hikmet Hajiyev said. Hajiyev noted that Azerbaijan's embassy in Mexico has already been given appropriate instructions on the matter, APA reported. American celebrity chef Anthony Bourdain has visited Armenia and Nagorno Karabakh, to the delight of Armenians and the chagrin of Baku. Bourdain visited the region last week, filming an episode of his CNN show Parts Unknown, in which he explores the exotic food cultures of various far-flung countries. He was photographed enjoying an al fresco lunch near Shusha, in Karabakh. And he hobnobbed with several Armenian celebrities. His host in Shusha was well known historian Tatul Hakobyan. In Yerevan he met Narek Margaryan and Sergey Sargsyan, the duo behind the TV show ArmComedy. And on twitter, Bourdain thanked Serj Tankian, the Armenian-American leader of the rock group System of a Down, for arranging the visit: "Thanks @serjtankian for finally getting me to Armenia and making it awesome." 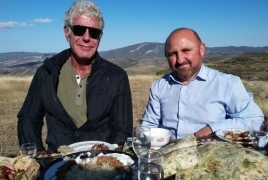 At the lunch, Bourdain enjoyed Armenian dishes including "‘jingalov hats,’ ‘shila,’ ‘khorovatz,’ homemade Armenian yogurt, and mulberry and cornelian cherry vodka," Hakobyan's institute, the ANI Armenian Research Center, reported on its web page. Bourdain also posted an instagram photo of an Mi-8 helicopter, apparently his transportation in and out of Karabakh, which is inaccessible to commercial air travel. Bourdain's social media posts got hundreds of enthusiastic responses from Armenians, but elicited the ire of Baku. 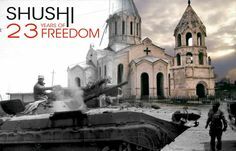 Karabakh is de jure part of Azerbaijan but has been under the de facto control of Armenian forces since a war between the two sides ended in 1994. Foreign Ministry spokesman Hikmet Hajiyev tweeted a number of responses to Bourdain, including: "@cnni to present ethnically cleansed land of #Azerbaijan by #Armenia as travel show shameful and #immoral. It must be stopped!" and "@cnni culinary show must be kept away from pol. propaganda as you try by this film propagate illegal regime in seized lands of #Azerbaijan." Bourdain didn't respond to any of Hajiyev's tweets, and it's unknown what his position on Karabakh's status is. Hajiyev later told the APA news agency that the ministry was looking into the affair and that "a decision will be made after the investigation." Bourdain would thus seem to be headed for Azerbaijan's black list of foreigners who have visited Karabakh without Azerbaijani permission, whom Azerbaijan considers to have illegally crossed its borders. If so, that would seem to rule out a future visit to Azerbaijan to try that country's cuisine; members of the Karabakh black list are forbidden entry to Azerbaijan. That, then, would mean Bourdain couldn't complete the Caucasus trifecta. He visited Georgia in 2015, though the show that resulted rubbed many Georgians the wrong way for being "weird, glib and uninformative." The Armenia/Karabakh episode is reportedly scheduled to run in 2018. Bourdain thanked Serj Tankian, the Armenian-American leader of the rock group System of a Down, for arranging the visit: "Thanks @serjtankian for finally getting me to Armenia and making it awesome." PanARMENIAN.Net - CNN will air the episode of its original series “Anthony Bourdain Parts Unknown” shot in Armenia on May 20, the TV news channel said on Monday, April 9. Bourdain takes a wide-angle look at the culture and history of this country, with musician of Armenian descent Serj Tankian (System of a Down), and historian/Armenian resident Richard Giragosian as his guides. Breaking bread with Tankian at a restaurant in downtown Yerevan, during dinners with locals, the host explores the native and Diaspora Armenian populations’ survival and achievements against the odds. Described by The New Yorker as a “swaggering chef,” Bourdain has built an empire around food, which started with his New York Times best-selling book “Kitchen Confidential: Adventures in the Culinary Underbelly” (2000). Today, he is well-known as a TV personality and has starred in shows on Food Network and his Travel Channel show, “Anthony Bourdain: No Reservations,” which has Bourdain traveling to unexpected locations and indulging in those regions’ local culinary traditions. When in Armenia, Bourdain posted a picture to his social media account of his cameraman, Jerry Risius, boarding a Russian helicopter, likely to make a journey to Artsakh (Nagorno Karabakh), where he has been featured in pictures across social media. Following that, he joined a plethora of other celebrities, diplomats and ordinary citizens that have been banned from Azerbaijan for visiting Karabakh. PanARMENIAN.Net - On this week's episode of CNN’s Parts Unknown, Anthony Bourdain will be discovering the Armenia people outside of the country rarely see on Sunday, May 20. On this week’s episode of Parts Unknown, former chef and current TV host Anthony Bourdain traveled to Armenia with Armenian-American musician Serj Tankian, of System of a Down fame, as well as historian Richard Giragosian, a resident of the country. During the episode, Bourdain dined at the highly regarded restaurant and learns about the Armenian people’s achievements against tough odds throughout history. Parts Unknown: Armenia aired this Sunday. Bourdain achieved celebrity status after the publication in 2000 of his bestselling book “Kitchen Confidential: Adventures in the Culinary Underbelly.” The book created a sensation by combining frank details of his life and career with behind-the-scenes observations on the culinary industry. It was a rare crossover — a book intended for professional cooks that had enormous mass appeal. He mixed a coarseness and whimsical sense of adventurousness, true to the rock ’n’ roll music he loved.